This recipe for Omelettes was submitted by Terry on 4/12/2002. Click here to view the recipe. This is the MOST delicious recipe to make especially if you have a Spanish family or if you wanna try something new. Love it. I loved this recipe and I love this website. 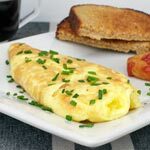 It was very easy to understand the ingredients and steps to make this omelet. This recipe is tasty and I plan on coming back for more. Very good! Love using eggs this way. I did it with closer to 1/3 cup olive oil. 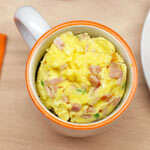 Very simple, but good omelet. Was good with salsa on top. I made this for brunch last week and it was amazing! The only thing I added was melted cheese and topped with warm salsa and sour cream! Thanks Mr. Breakfast. Very good. Crispy edges and tender on the inside. Good as leftovers reheated too. What else could I add if I don't like onions? Any suggestions out there? This is a favorite in our household, and I grew up eating it - my mother has absolutely mastered this and to this day I struggle to match her skills. My secret ingredient to this is chili flakes - I add them prior to the flip - and it adds a nice little kick if that's your thing. Enjoy! I made it for Spanish class and it was very good. I totally agree that it was hard to flip over. That's the worst part. Other than that, it is easy and tastes really good. Flipping it is kind of scary. I slide it on a plate and then turned over the plate. I cut the potato into small cubes, not slices. Overall, I was really happy. Beautiful golden brown color. I've come to this recipe myself without knowing of the Spanish name. Of course, everybody claims their omelet recipe and so do I ;) If I may do some suggestions: Use potatoes you cooked the other day. This is why I cook some extra potatoes and store them in the fridge. Keep them with a lid on it, because else they get dry, go bad too soon and might take on scents from other food). Another recommendation I have is: Fry the onions separately, not to hot or fast and until they are completely browned ('carameled'). This can take up to 20 minutes but it's really so much more tasteful! I guess this is slow food but you should really try it once. BtW use 2 or 3 onions, not just one because it will become much less after most of the water has gone. Mmmm. I like it!! Try it with pesto and it's very good. It's a healthy and fast breakfast! It's really good, but it's very simple. I might suggest grating some Manchego cheese over the top for just a little more flavor. This recipe is yummy because my new friend javier is Spanish and the best person in the world. I tried this recipe and its exellent. 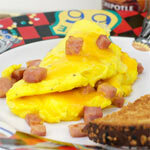 I used to make omelettes like this years ago, but have since forgotten how to make them. all receipes i've seen lately is for 1 cup of chopped potato and capsicum. don't know where they get that one from. Instead of flipping the tortilla over during cooking, it is much easier to pop it in the oven for a few minutes until set. Then flip it onto a plate to serve. I lived in Madrid for 4 years and never saw green peppers in the tortilla. Eggs, onion, potatoes, olive oil and fresh garlic served warm or at room temperature (not cold!) is the key. Que bueno! 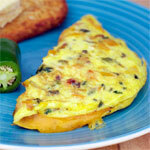 I'm looking for the recipe for Spanish omelet that has green pepper, onions, tomato sauce over the omelet. I mix the potatoes in with the egg mixture before frying as was taught to me by my Grandfather which was born in Spain! We don't use green pepper either but use chopped up ham cut in thin slices. 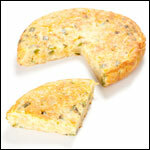 You can not beat Spanish Omelet cold in a Tapas Bar! I had to have it at home too!